If an operator logs onto the system earlier or later than the time defined in the Operator File and the difference in minutes is greater than this value, the system will consider this an exception and notify the manager through an Elliott Event. The manager can specify a different value for each operator in the Operator File. If an operator logs off of the system earlier or later than the time defined in the Operator File and the difference in minutes is greater than this value, the system will consider this an exception and notify the manager through an Elliott Event. The manager can specify a different value for each operator in the Operator File. 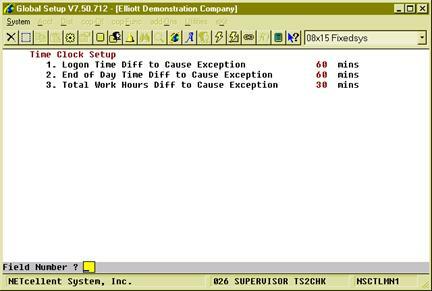 If an operator’s working hours are more or less than the hours defined in the Operator File and the difference in minutes is greater than this value, the system will consider this an exception and notify the manager through an Elliott Event. The manager can specify a different value for each operator in the Operator File. 26. Customize Routing for Feature/Mfg Item? This flag enables a feature to choose and customize routing for feature or manufactured items in the order line item screen. N (Default) – Disable this feature. 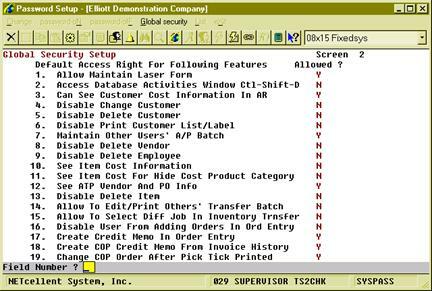 A – Always enter a routing for feature items or while customizing a manufactured item. 27. Use Scrap to Calc Customized Mfg Item Cost? This flag indicates how the scrap cost of a customized manufactured item increases the unit cost. 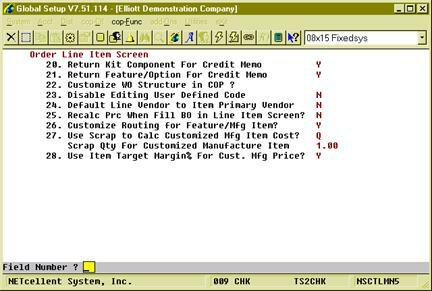 If you select “Q” or “P”, Elliott will prompt for “Scrap Qty/Pct For Customized Manufactured Item”. This indicates what amount or percentage will be scrapped for customization. 28. Use Item Target Margin% For Cust. Mfg Price? This flag indicates that if the unit price should be calculated based on unit cost and target margin. If set to “Y”, the system will use the new calculated price. This is the Security Setup for Elliott. You can set a default value for these security flags through Global Default Security and configure the flags for each Elliott user. The position of each flag on the screen may vary between Global Default Security and User Global Security. “N” – Do not allow the user to view any item related cost, ex. Item Unit Cost and the material part of the production cost. This applies to both reports and screens in WO+. The Outside Process Cost counts as material cost. “N” – The system will not allow an operator to close a production work order until the quantity reported is enough complete all the parent items. The location of this flag may be different in User Global Security. “N” – Do not allow the user to view labor rate related cost, including labor cost and burden cost. This applies to the reports and screens in WO+. If an operator reported incorrect information in a production transaction and posted it, which can cause a dramatic change in production cost, an operator can create reverse transactions to offset all statistics of that posted transaction, including quantity, hours and costs. This flag indicates if the user has the right to create reverse transactions. If an operator needs to modify a transaction of a closed Work Order, the Work Order must be reopened first. This flag determines if the user has the right to reopen orders. Allows the user to import Work Orders through CSV files. Allows the user to all the Plus Work Order features. 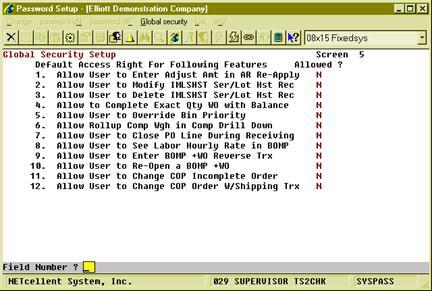 If the user is not allowed to use WO+, the system will hide or disable all features related to WO+.